Brunch. It’s not just for Mother’s Day anymore. We’re always looking for leisurely weekend options, whether a traditional spread at The Whitney or Marais or the comfort food approach of Brooklyn Street Local. Here are a few new favorites. Music and munchies are a great combination, even for breakfast. By night, The Morrie is a roadhouse and live music venue. They serve up smoked chicken wings, charcuterie plates, and matzo ball soup, as well as ribs, burgers, and steak. On the weekend, it’s a different story. Derik Watson, the executive chef who oversees the kitchen and menu at The Morrie and Bistro 82 (our 2017 Restaurant of the Year), has put together a winning brunch lineup. 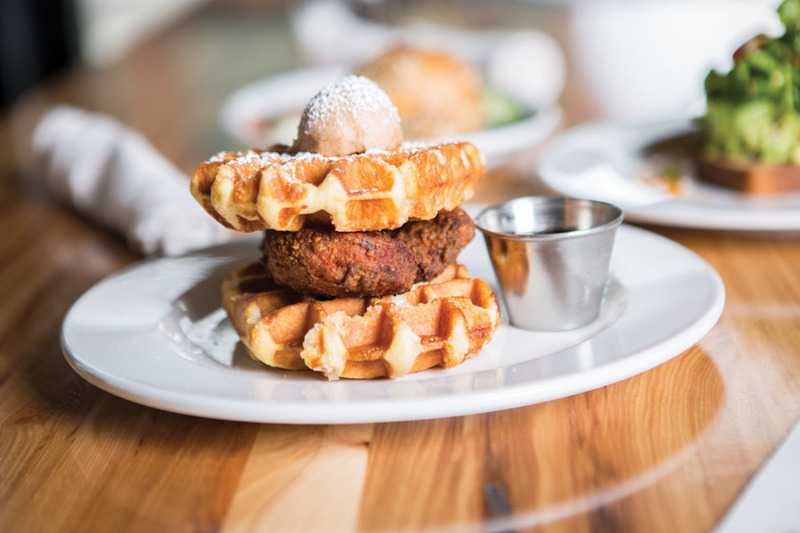 There’s a Nashville hot chicken and waffle stack, a pork belly version of eggs Benedict, and mushroom toast. Not to be missed are the well-portioned “bowls” like the brisket bowl with scrambled eggs, tater tots, roasted corn, Manchego cheese, and spinach. The veggie bowl includes root vegetables such as beets and tots made from sweet potatoes. And of course, there are bloody marys and mimosas. While it’s not exactly a traditional brunch setting, it is young-family friendly. Plus it’s fun to watch new moms and dads sway to the live music to entertain or comfort their little ones. 511 S. Main St., Royal Oak; 248-216-1112. Br. Sat.-Sun. The weekday menu is eclectic, with fried goat cheese, Korean sliders, and chicken fingers coated with Cap’n Crunch cereal. The weekend brunch is a hit, too. The build-your-own bloody mary bar also has a “man-mosa” — a 20-ounce mug of orange juice with champagne, orange vodka, and beer. Bring your appetite, too. Cap’n Crunch makes an appearance on French toasted apple bread. There’s more to like on the sweet side, including Nutella stuffed pancakes. There’s also avocado toast, sausage hash, and biscuits and gravy, with traditional or vegetarian options. In fact, the veggie crowd has a host of choices, including a side called “Martian Landscape” that has potatoes, avocado, green onion, verde, lemon sour cream sauce, and cheddar. Brunch is also expected to be added at Bonnie’s second location in Wyandotte. 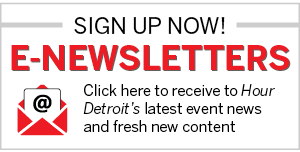 1800 Michigan Ave., Detroit; 313-962-1383. Br. Sat.-Sun. Treat that special someone in your life by taking them to this converted Rochester mansion, which was built in 1917 for William Clark Chapman. The ambience and scenery are a feast for the eyes, and the French-inspired cuisine is worthy of its sophisticated setting. 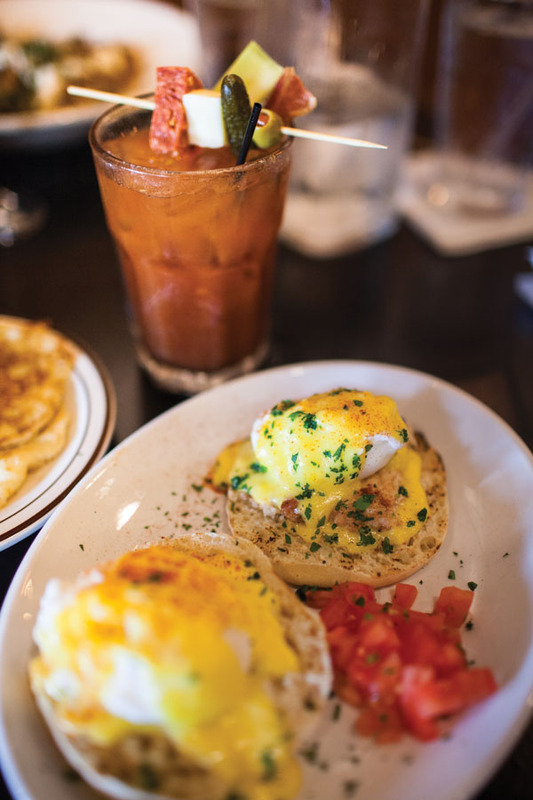 Like its dinner menu, Chapman House offers a well-edited bill of fare for brunch that features classics such as perfectly executed eggs Benedict and waffles as well as pastrami hash with poblano, mussels and frites, and buttermilk biscuits and gravy, one of the standout dishes. The kitchen, helmed by Culinary Institute of America alum Chris Cason, emphasizes seasonal and local and makes a lot of ingredients in house, such as house-smoked bacon and the don’t-miss ginger and sage sausage. Start or end your meal with ricotta doughnuts if they’re available. 311 Walnut Blvd., Rochester; 248-759-4406. Br. Sun.